5 BRs/2 BA with outdoor enclosed/heated shower. Sunny, happy, cottage-like home! Many summer weekly rentals for 2019 will be re-booked with repeat renters. Some of these weeks are already blocked off on our calendar, others will be blocked off as guests check out and confirm a re-book. Reservations will not be finalized until they are invoiced in January. We continue to take inquiries until then, in case one of the weeks opens up. Please feel free to inquire about any week. If the week you are interested in has a hold on it, you may request to be notified if the hold does not book. Our calendar will reflect exactly which summer weeks remain available after January 31, 2019. Thanks so much for your interest in our home and for understanding our loyalty to our repeat guests. Back to the Beach is a short 0.2 of a mile from Middleton Road, which is the middle of the island. To the East is restaurants, shopping, ice cream and putt putt . To the West , marina, fishing, crabbing, and watching the sun set so close to you, you feel you could reach out and touch it. The beautiful, new Lowes grocery store on 211 is just minutes from our house! And if you arrive on Oak Island from 211 South, you can count on shaving 25 minutes off your drive by cutting 'Long Beach' in half because of the new Middleton bridge. If relaxed, carefree days with family and friends is what you are looking for in your beach vacation this year, then look no more. Back to the Beach has you covered - from amenities, to comfort, to making memories that will last a lifetime, it's all a few clicks away! See more photos at 'Back to Beach' board on Pinterest! Amenities: 5 Bedrooms/ 2 Baths: 1 King, 3 Queens, 3 Singles. 6 CCTVs, 3 DVD players, VCR, wireless internet access, ceiling fans throughout, booster seat, board games and puzzles, Enclosed outdoor shower w/ hot & cold, covered porch with rockers. Hammock located under ocean front deck for guests' enjoyment. Nightly rentals available w/ 3 night minimum off season only. 3 pets allowed, $75 each. Direct Beach Access at foot of walkway from house to beach. SUNDAY TO SUNDAY weekly rentals. 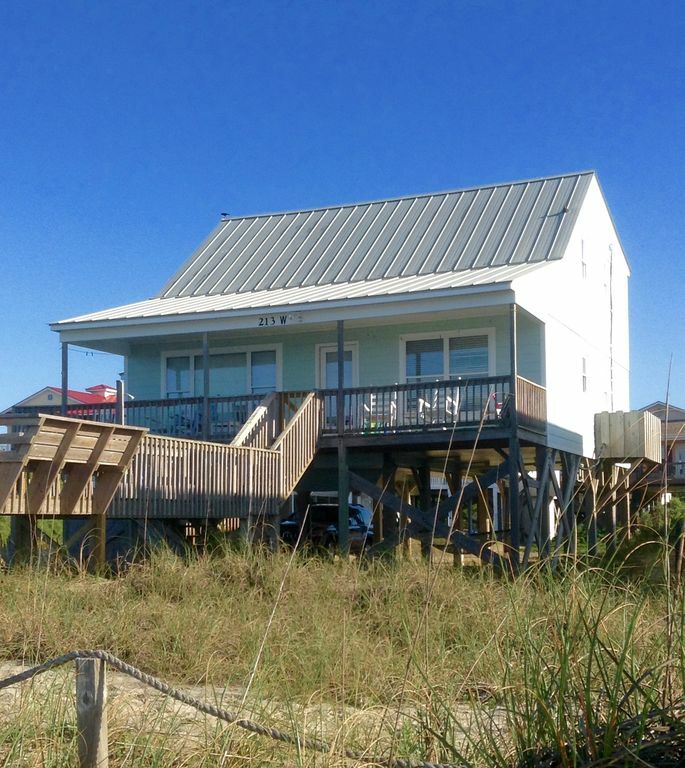 The owners of Back to the Beach are three families who love the Atlantic Coast and particularly love Oak Island with its simple charm and natural beauty. We all live within a couple of hours of each other, have been lifelong friends, and enjoy time together at Back to the Beach making lifelong memories. We vacationed on Oak Island for years and fell in love with it's simple, small town charm, affordability and beautiful, clear beaches. We love how the island offers a perfect mix of ocean/sand/salt air and marsh/oaks/pines. And we find something new to enjoy from all of the wildlife, natural scenery and activity that both sides of the island brings, every time we visit. Oak Island is one of the most friendly places we have ever vacationed. The locals here love the renters and it shows! We enjoy not having to wait too long for a dinner reservation or fight traffic to get where we are going. It's a family style, casual beach that treats you like one of the family and yet it is close enough to Wilmington and Myrtle that if you want the things larger beach cities offer, they are easily within reach. We love the history, restaurants and shopping in Southport. On the island there is golf, tennis, a skate park, natural areas and walking trails, marina with deep sea fishing - Oak Island truly has it all! When we began looking for vacation properties, Back to the Beach was the first house the realtor showed us. We looked at each other and said 'This will be hard to beat.' Its sunny, happy, light-hearted feeling captivated us from the moment we walked in. And when we stepped onto the oceanfront deck and realized we could practically FEEL the ocean on our face - we were sold! We love the layout of the home and how the whole main floor is a panoramic view of the ocean.The bedrooms are large and spacious. And being on West Beach close to Middleton and the new bridge is a top spot on the island! But what do we love most? How exclusive the beachfront feels in front of our house! Maybe it is the empty lot to the right of ours that makes us feel like we scored our own private beach on Oak Island? We don't know. But when we are here, we really get a sense that we have gotten away from it all and this little piece of heaven is all ours! The front of the house is all windows facing the ocean, which is just seconds away! Comfortable rockers on a covered porch so you can enjoy spectacular sunsets without even leaving the house! Linens provided in rate. Extra blankets for beds and throws for sofas in closets. Please bring beach blankets and towels for use on beach. Bath towels are provided for in home use. Covered parking for four cars. Eleven bath, hand and wash clothes. Dish cloths and towels provided as well. Please bring beach towels. Usually there is some dish soap and dishwasher detergent, paper towels and toilet paper to last you a couple of days. Occasionally a few condiments in pantry. Large dining room table with five chairs and table length bench. Four bar stools at island. Booster chair. Covered deck with rockers, incredible ocean front views. Bench seats on walkway. Shower rinse off on walkway that leads directly to the beach. Heated enclosed outdoor shower below deck. Hammock. Please let us know if you are planning something special for your getaway and would like recommendations or concierge-like services. Check in information will be emailed close to your arrival date. Pleasing decor, wonderful front porch, great layout of rooms,ideal and convenient location. Loved my time just relaxing- which I rarely do- the beach was perfect. Great house and amenities, though TV wasn't turned on until Fri for Carolina - Duke game. King sized bed was wonderful. Kitchen was well- stocked. Loved that application, payment, check-in and check- out were super easy. This beach house was a great place to stay. We will rent this place again in the near future. The view from the porch was just awesome. The only negative thing I can say is I wish there was gravel in the parking area instead of all sand. We kept having to sweep or leave the shoes outside. House was clean and fully stocked with items needed, including fun puzzles! This will be our future go to place for many years to come! Back to the Beach was a perfect place for our family trip! We have stayed at several houses over the last few years and this one fit our needs the best of any we have tried. There is plenty of room for a large family to sit and relax and also to have dinner at the nice big table. Everything was great and we plan to come back again!! This is such a special beach cottage!!! Location, location, location! The cottage is very warm and comfortable and the best supplied kitchen ever! The outdoor shower is perfect! Great time! 213 W. Beach Drive, Oak Island, NC. Our house is not far past Middleton Road - perfect location! West Beach, quiet, family area, but right in the middle of the island, where either side of the island is easy to get to. We have an empty lot beside us, so the beach is practically all ours. Access is literally at the bottom of our walkway. You will love how easy things are at Back to the Beach! NIGHTLY MINIMUMS: Nov. 1 - March 31, 3 night minimum April 1 - Oct. 31, 7 night minimum Check in anytime after 3 pm Check out 10 am You may pay a non-refundable $59 damage protection policy OR a $200 refundable damage deposit, if no damage to property or premises occurs. Please let us know if you prefer the $200 deposit, otherwise the policy will be included in the quote. PETS ARE WELCOME: 3 dog max., $75 per dog. All rates include linens and maid. Damage protection is required for all reservations. This bills as $59 from a third party and is included in your first invoice. Optional is a fully refundable $200 policy, refunded within 48 hours if no damage to the premises occurs. PLEASE LET US KNOW IF YOU PREFER THE $200 DAMAGE DEPOSIT, otherwise the $59 policy will be included by default. We are unable to discount rates or offer fewer than the three night or seven night minimum. We are also unable to take personal checks. EARLY RESERVE POLICY: You can secure the same rental dates in the following year if you email, text or call Beth before you check out. A reminder is on the "Check Out" sheet that will be emailed to you once you book. If this is not done, we can not guarantee you the same vacation dates the next year.